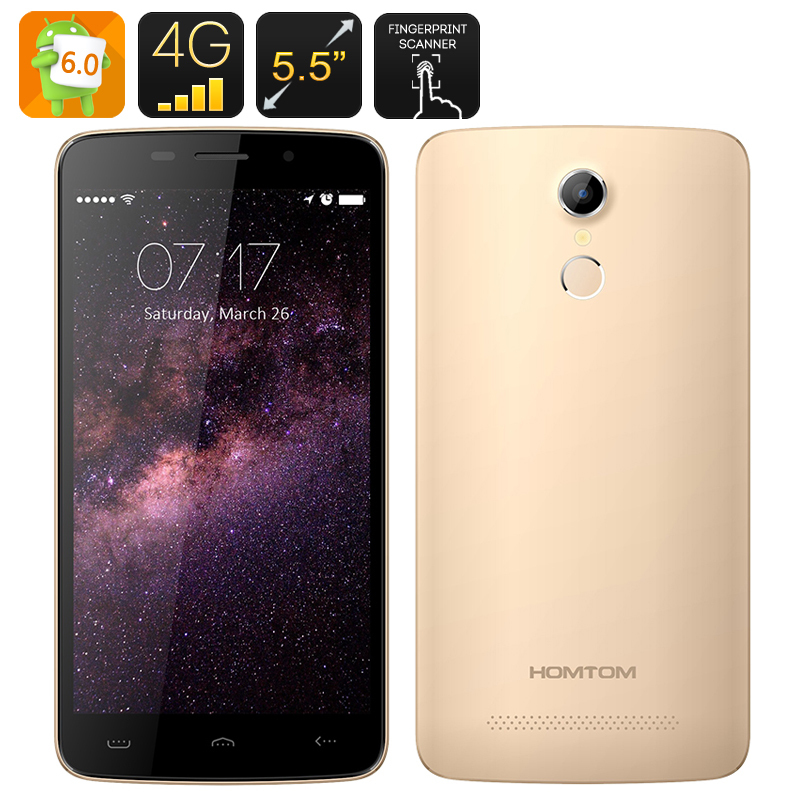 Successfully Added HK Warehouse HOMTOM HT17 Android 6.0 Smartphone - 5.5 Inch HD Screen, MTK6737 Quad Core CPU, Fingerprint Scanner, 4G (Gold) to your Shopping Cart. The HOMTOM HT17 is a great option for those looking for a modern smartphone with the latest feature offering — and for a reasonable price. Sporting the latest Android OS — Android 6.0, 4G connectivity, dual SIM slots and an elegant design, the HOMTOM HT17 has everything today’s mobile user might ask for. Enjoy fast web speeds and easy downloads with the HOMTOM HT17, sporting 4G connectivity that you will be able to enjoy on two SIM cards. There are lots of benefits that come with having two accounts on one phone — you get to easily separate your work and private life, have multiple social media accounts and more. The 5.5 inch HD screen provides a great platform for enjoying your media and web browsing. With Android 6.0, you will have the latest OS at your fingertips with access to the Play Store and numerous upgrades that come with. The HOMTOM HT17 comes with Hot Knot 3.0 — a new and improved version of the popular data transfer system. Quite similar to NFC, it lets you exchange data between two devices. However, instead of touching the NFC chips at the back of the phones, you touch them screen-to-screen. Sporting quite a few navigation shortcuts, HOMTOM’s HT17 can be unlocked with a gesture, supports motion control and lets you take a screenshot by tapping the screen with 3 fingers. Featuring a fingerprint scanner, the smartphone offers enhanced privacy protection, keeping your data away from prying eyes. The 3000mAh battery offers up to 12 hours of non-stop talk time and you will get about 200 hours on standby. With two cameras, quickly capturing important moments will be easy and 8GB of internal storage + 64GB externally give you plenty of space for all your media. The HOMTOM HT17 Smartphone comes with a 12 months warranty, brought to you by the leader in electronic devices as well as wholesale Android Phones.. Thank you my friends !!!! Received an order! Very satisfied. Respect to the seller and to all of you ! !